This classic, traditional Shingle-style home was transformed from an outdated 1950’s production ranch-style home, with a complete renovation of the entire 1st floor and an entire 2nd floor addition. The result is a completely updated home with an open, functional floor plan with classic, timeless architecture. Adherence to authentic Shingle-style design elements were carried throughout the exterior of the home as well as throughout the interior detailing and material selections. The façade of the home features shake siding above the original brick base, groupings of mulled double-hung windows, playful steeply-pitched gable rooflines, bracket detailing at the multi-level eaves and a large front-entry porch with classical columns. 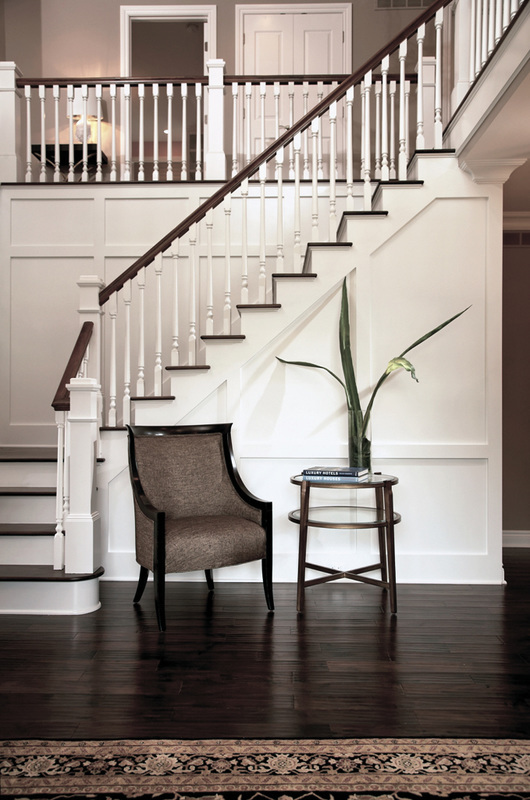 The 2-story foyer entry is light and welcoming and features beautiful, traditional white-painted millwork panels with an elegant staircase which wraps around the entry space to a 2nd floor reading loft that overlooks the entry. Beautiful, classic white-painted millwork is carried throughout the home with the deep coffered ceiling in the sunroom, a Shingle-style mantel and surround of the fireplace in the breakfast dining, the cubby lockers in the mud hall and throughout the trim work of the house. This elegantly understated French-Provencal-inspired home was designed to blend into an established neighborhood and to adhere to classic design principals to create a timeless, classic architecture. 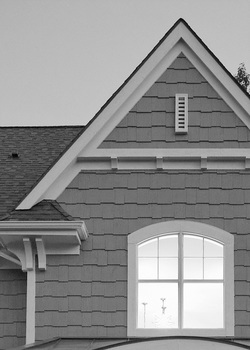 The lines of the exterior massing are simple, restrained and graceful with broad gables and eaves softly flared upward at the roof-wall junction. 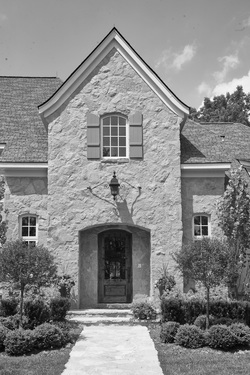 An old-world masonry stone installation was used to achieve the white-washed finish look of the stone inspired by homes in the Provencal countryside. ​This is juxtaposed with the soft dove-grey stucco that continues the weathered sun-bleached color palette. The restrained elegance continues in the interior with classic, traditional French style blending with chic, French modern style. Chic, French modern furnishings and accents are artfully used throughout the interior spaces. A simply cut limestone fireplace in the living room is surrounded by traditional and French modern furnishings and artwork. Classic materials are used throughout the interior to create a timeless architecture. Chestnut-stained walnut floors flow throughout the rooms, Venetian plaster is installed in the dining room and powder room, paneled walls adorn the library and classic white cabinetry is featured in the kitchen. 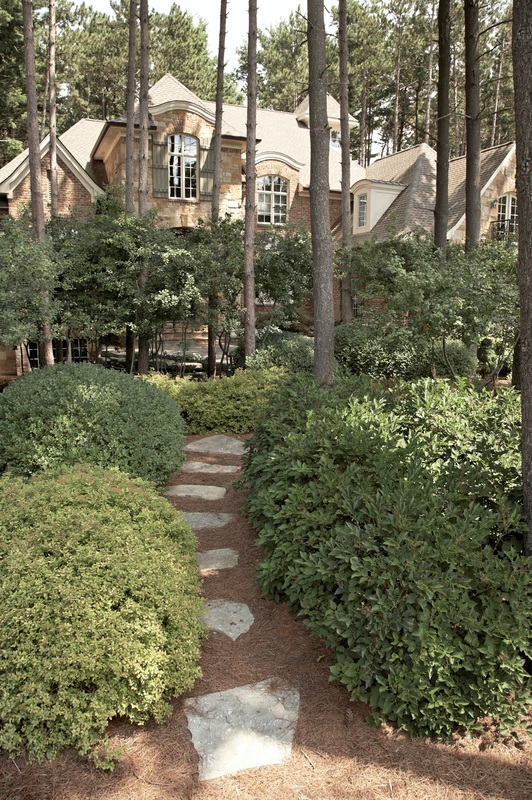 This traditionally designed English Manor inspired home is beautifully sited on acreage surrounded by formal gardens planted with boxwood, hydrangea, and roses that extend to manicured lawns and wooded acreage beyond. The approach is along a private drive that winds gently to allow views of the home and continues through the porte-cochere to the motor courtyard at the rear of the home. A large 2-car garage is attached to the home, with an additional 2-car garage attached by the porte-cochere, allowing the garage doors to face into the rear motor courtyard and elongating the footprint of the home appropriate for the extensive acreage. The floor planning of the home is traditional, classic and ordered with beautifully designed symmetrical spaces that open to each other, allowing expansive site lines throughout the home. 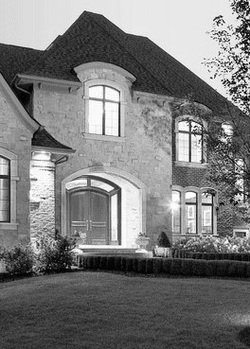 The classic, symmetrical concept of the floor plan is established upon first entering the home with the mahogany front-entry doors of the spacious foyer on centerline with the dramatically scaled limestone fireplace of the gathering room beyond. White-painted, paneled millwork delineates the spaces. 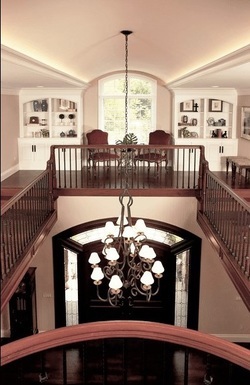 The floating circular staircase on the South wall is on centerline with the formal dining room on the opposing wall, further reinforcing the classic symmetry of the plan. This vernacular Shingle-style home was designed for a young active family for a family oriented neighborhood. The design concept was to create a very livable and functional home that blends traditional Shingle-style design with youthful, chic, and ‘urban’ design elements for a modern, upbeat home to raise a family. 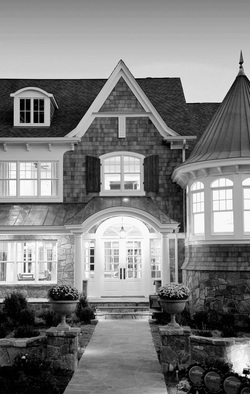 Traditional Shingle-style design elements are showcased in the exterior with the asymmetrical, free-form of the exterior shingled surfaces over the stone base, the multiple groupings of double-hung mulled windows, the wide front porch, and the eyebrow-dormer window. Traditional elements continue inside the home with the beautiful white-painted millwork and coffered ceilings, classic traditional white cabinetry and the medium-dark-stained walnut floors that flow throughout the rooms of the home. 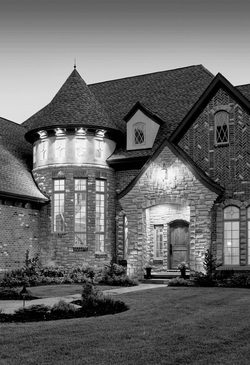 This creates a timeless classic architecture. This is juxtaposed with modern design elements like the unique ‘barn-door hardware’ sliding door system that closes off the laundry/ craft room from the gallery hall, and the modern and urban-style fixtures and furniture throughout the home. The floor plan is very open with the large kitchen space open to the casual dining, screened-in outdoor living porch and family room. A beautiful master suite is located on the main level, while children’s bedrooms are on the second floor. 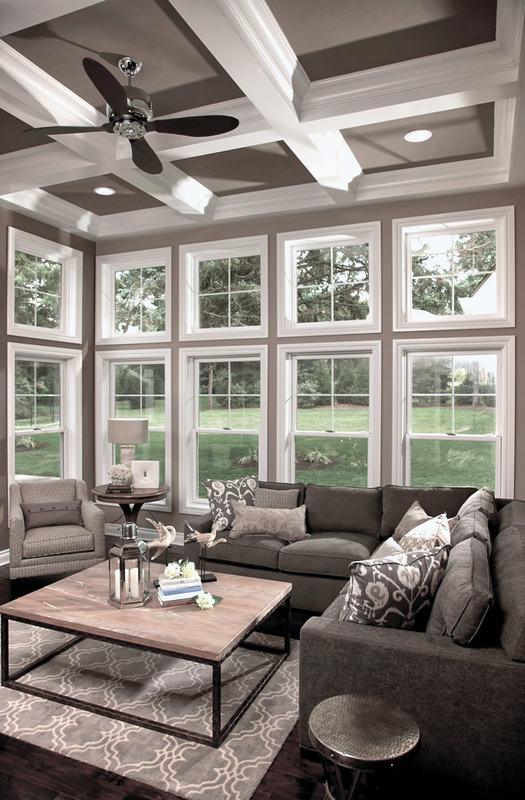 Natural light floods into these spaces from multiple groupings of large beautiful windows. A beautifully finished lower level features a recreation/ play area, a chic martini bar, home office space and a theater room. This English-style country home was designed to blend English Tudor architecture with the simple character and charm of Cotswold style. It is beautifully sited on acreage, surrounded by manicured lawns and mature trees. Designed to ​accommodate the active lifestyle of a young family, the interior design showcases elegantly-rustic materials with beautiful-livable finishes that are designed to patina gracefully over time. 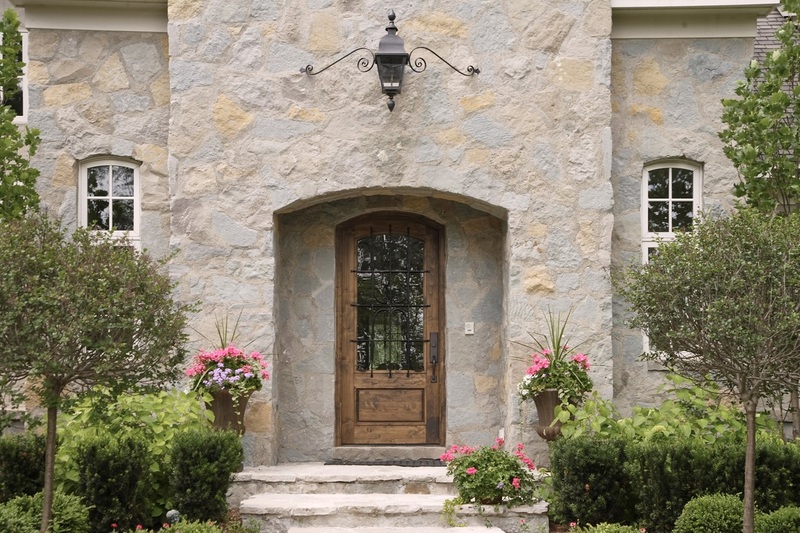 The stone that was used on the exterior was brought into the interior to add textural interest and was used in the foyer space to create a private stone-entry rotunda into the main floor owner’s suite. 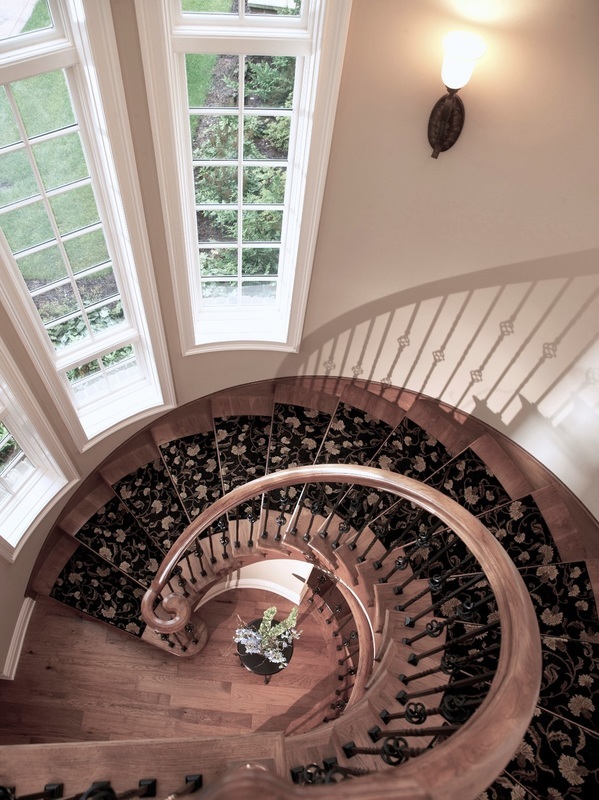 ​This is balanced with the winding stair, which allows access to both the 2nd floor bedrooms and lower level entertainment area, which is placed in a turret on the opposing end of the main entry hall area. The floor plan is very open with the foyer space flowing into the family room, which is open to the large country kitchen, casual dining and sunroom. Large expansive windows allow natural light to flood into the rooms and provide views of the beautiful surrounding countryside to integrate the interior spaces with the exterior. 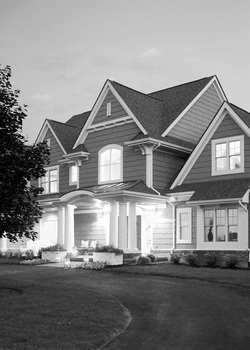 This classically designed Shingle-Style model home showcases the exquisite design, quality craftsmanship and impeccable attention to detail that the designer and builder bring together to create luxury homes for their clients. 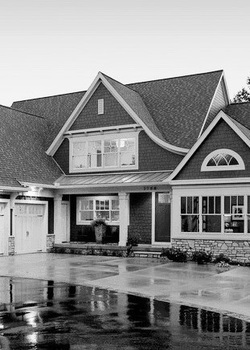 The design challenge was to create a very livable and functional home to appeal to the active lifestyles of this family-oriented community, while at the same time creating a timeless, classic architecture with historic references to Shingle style. A wide entry porch, defined by classical columns, and the Palladian-style front entry doors, sidelites, and transom are graciously welcoming. A tower, with a steeply-pitched, standing-seam metal roof, becomes a dominant architectural feature. The exterior materials blend vernacular stone, natural cedar shakes, and beautifully detailed trimwork and brackets painted crisp white. This vernacular Shingle-style model home was designed for a young active family for a very family oriented neighborhood. The design concept was to create a very livable and functional home that blends traditional Shingle-style design with youthful, chic, and ‘urban’ design elements for a modern, upbeat home to raise a family. ​Traditional elements continue inside the home with the beautiful white-painted millwork and coffered ceilings, classic traditional white cabinetry and the medium-dark-stained walnut floors that flow throughout the rooms of the home. This creates a timeless classic architecture. An outdated 1950’s production ranch-style home was completely transformed into a 2-story Shingle-style home in this large renovation of the entire 1st floor, which also involved an entire 2nd floor addition. The entire façade of the home was redesigned in a classic Shingle-style with new double-hung windows, shake siding, and a large front porch with columns. The bedrooms of the original ranch plan were relocated to the 2nd floor and spaces on the 1st floor were reallocated to create an open floor plan with spacious rooms that function for today’s lifestyle. The ceiling height was raised from the original 8-foot to 9-foot throughout the entire 1st floor, with a 12-foot high coffered ceiling in the sunroom. The new 2-story-foyer space is light, elegant and welcoming, with a classic stairway that wraps around the entry space to a 2nd floor reading loft that overlooks the entry. Classic Shingle-style design and materials were carried throughout the interior for a casually elegant and restrained design style. 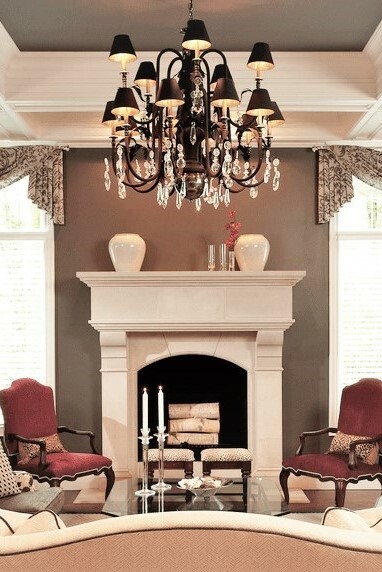 Beautiful, traditional white-painted millwork panels are featured in the foyer, a Shingle-style mantel and surround were designed for the fireplace in the breakfast dining, and traditional coffered ceilings and millwork are carried throughout the home. ​​Shingle-style cabinetry was installed in the kitchen and butler’s pantry and hand-scraped, dark-stained walnut floors were installed throughout. The original 2-car garage was enlarged and a mud hall space was added to redirect the traffic flow into the house from the garage and a new side-entry porch. The design concept for this outdoor living space was to create three distinct terraces that step down to follow the topography of the land - to maintain the natural drainage of the site, in order to protect the 65-year-old towering pine trees on the property. These outdoor spaces become less refined as they are located further from the home, and create three distinct areas for conversation, dining and lounging. The stone loggia and the uncovered area of the main-level terrace can be accessed from either the ‘summer kitchen’ or sun room of the home. The same French limestone flooring, with hand-painted accent tiles, that was installed in the sun room was carried into this outdoor space to integrate the interior and exterior spaces. ​A two-sided stone masonry fireplace creates a cozy conversation area and defines the space between this level and the lower terrace. 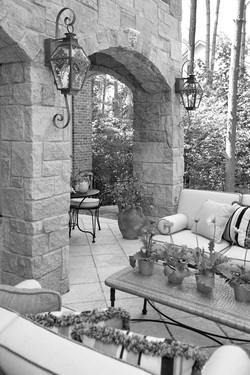 Stone arches and gas lanterns create an old-world ambiance consistent with the French eclectic style of the home. The mid-level terrace is used for alfresco dining and is defined by the boulder-retaining wall that facilitates the natural drainage. Fragmented flagstone is installed on this level and flows onto the lower level. Rough-cut boulders create the steps from level to level. The lower-level terrace is on grade and is surrounded by the natural wooded area and wildlife. The experience of lounging in this area is of being immersed in nature. Beds of English ivy and lamium soften the hardscape. 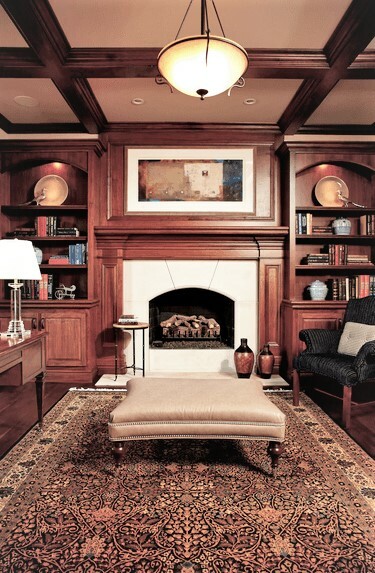 The design concept for this space was to create a traditional, English-style country estate library that is beautifully proportioned, balanced and restrained allowing all of the exquisite elements to work in harmony together. 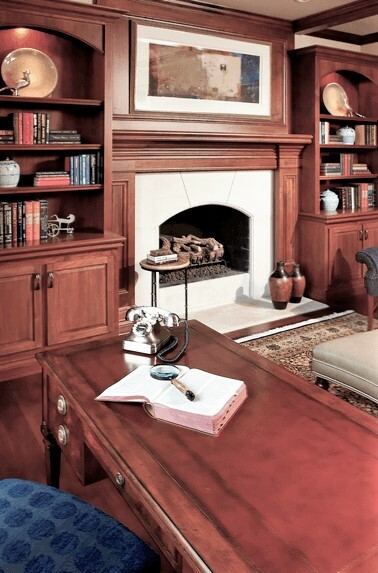 Custom, finely-detailed walnut millwork is featured in the beautiful fireplace mantle and surround, and bookshelves that flank the fireplace on the South wall of the room. The bisque-colored cut limestone surround of the fireplace creates a pleasing contrast with the stained millwork. 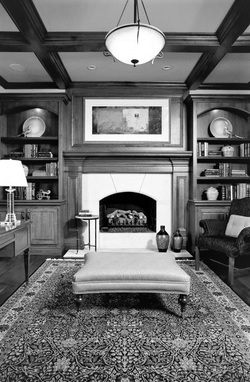 The impeccable millwork is continued on the paneled walls of the library and the coffered beams of the ceiling. The bookshelves house a collection of antiques featuring blue and white porcelain alongside books. A hand-woven wool rug sits on the dark-stained walnut floors that flow into the room from the gallery and foyer beyond. A large window grouping on the East wall enables expansive views to the beautiful gardens and acreage that surround the home, while allowing natural light to flood into the room. Beautifully edited furnishings include an antique walnut desk, leather console, and nail-studded leather ottoman juxtaposed with the modern painting above the fireplace. The original sun porch was an outdated space with burgundy-red painted brick walls, wall-to-wall green carpeting and a 7’-4” flat drop-ceiling. The entry from the original garage cut through this room to the kitchen area. 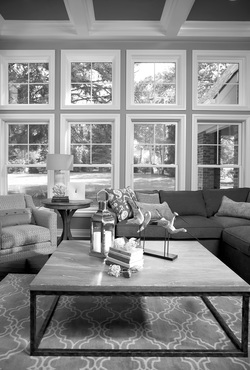 This sunroom is light, elegant and consistent with the Shingle-style of the home. It is comfortable and welcoming, yet exquisitely restrained. Large 3-foot-square transom windows, stacked on top of the large double-hung windows on two sides of the room create an envelope of glass with beautiful views of the backyard. The sunroom is open to the elegant, casual breakfast dining and the classically-designed kitchen to create a very open floor plan that integrates these spaces. Hand-scraped, dark-stained walnut floors are installed throughout. This charming, inviting sunroom is exquisitely detailed consistent with the French eclectic architecture of this country estate home. 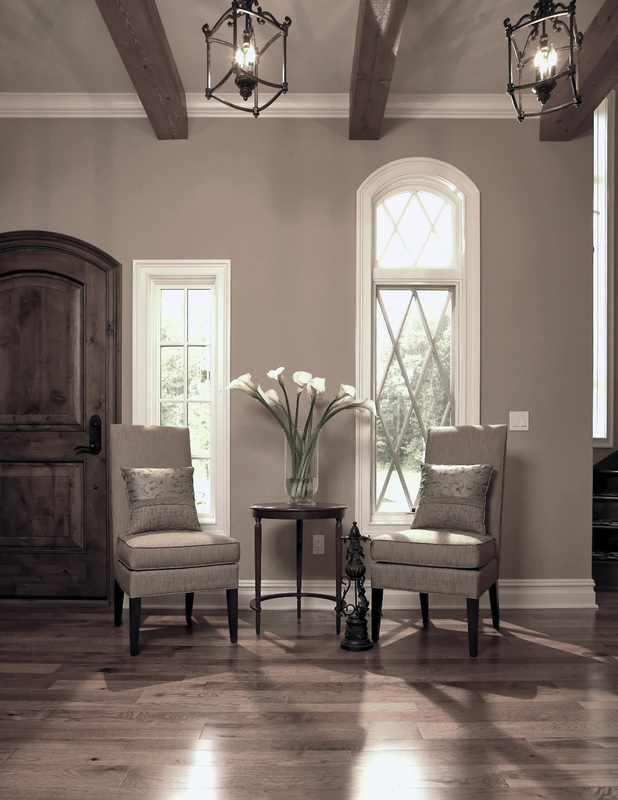 The walls are authentic Venetian plaster that artfully radius back to the window and door frames, without the use of any trim, in authentic old-world style. The Venetian plaster is an old-world blend of natural warm sun-bleached colors with a soft luminescent patina that glows when light plays across the surface. ​It sets the color palette for the room in the fabric selections for the cushions and pillows of the vintage rattan and woven furniture. The floors are tumbled French limestone with hand-painted accent tiles and are heated for comfort. Square transom windows are set above the tall casement windows and French doors that wrap around the room and are continued above the interior French doors that open to the breakfast dining space. This creates a continuous visual line that moves the eye through the space for a cohesive balanced design and allows abundant natural light to flood into the room. The sunroom opens to a covered veranda that features flicking gas lanterns, stone arches and an exterior stone fireplace. 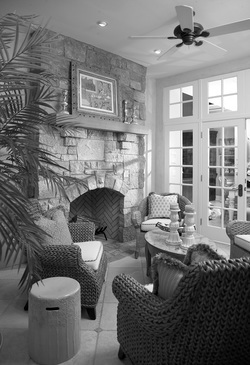 The stone that was installed on the exterior of the home was brought into the design of the stone masonry fireplace in the sunroom to integrate the interior and exterior spaces. ​The fireplace anchors the space and creates a cozy ambiance which transforms the sunroom into a space that is equally comfortable and enjoyable in the cold winter months. A beautifully balanced symmetry is created in this master bath of a traditionally designed French-eclectic-style home with “his” and “hers” vanities flanking a free-standing jetted tub set in a bay window. A vaulted ceiling and crystal and silver chandelier further reinforce the strong design of the symmetry. 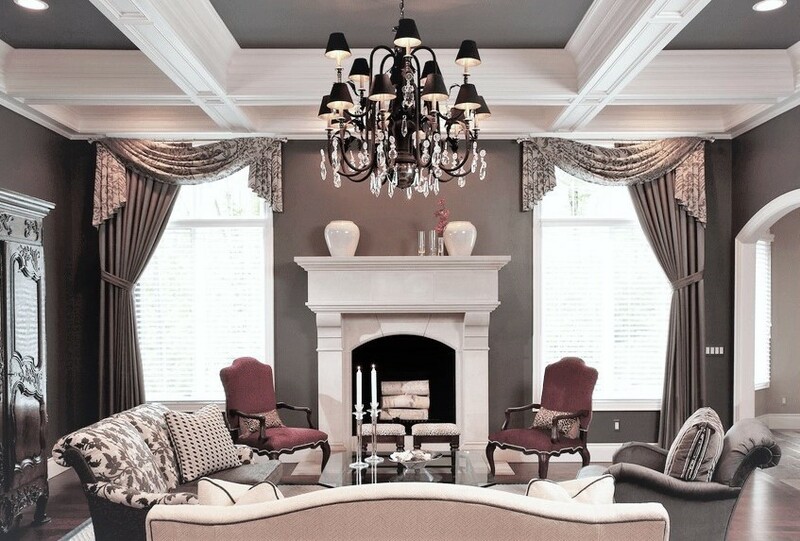 ​A monochromatic color palette was chosen for its upscale, soothing effect. Carrara marble on the floor and vanity tops integrate the space, and with the vintage crystal hardware on the soft gray vintage-style cabinets create an elegant, romantic ambiance. 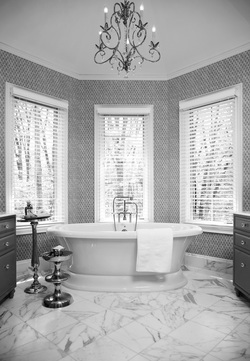 A large walk-in shower completely encased in carrara marble and a separate toilet room and dressing area complete the bath design; while the bay window, which accommodates the free-standing jetted tub, creates a turret element on the exterior of the home consistent with the French eclectic architectural style. 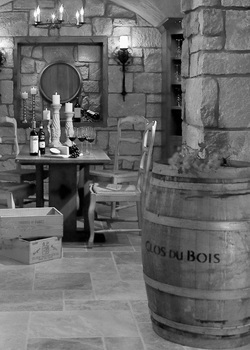 Inspired by the vast underground wine caves of the French Chateaux of the major wine regions, this tasting room, in the underground level of this French Eclectic style home, was designed for private wine tastings. 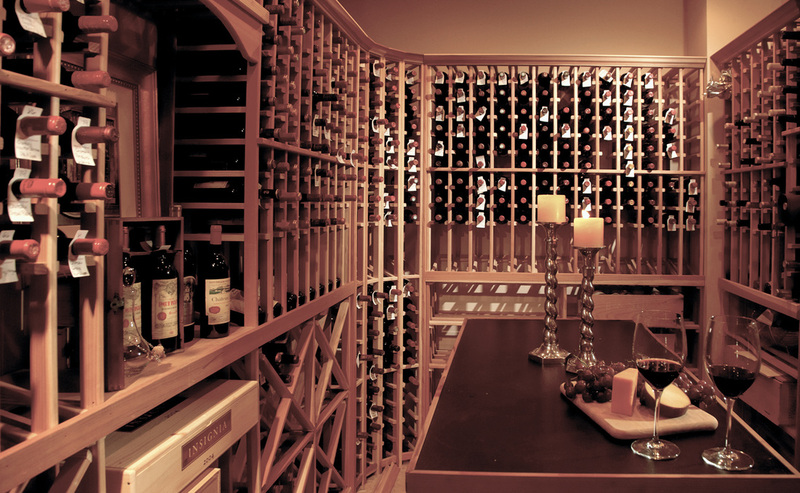 The wine cellar, directly off of this space, is equipped with state-of-the-art electrically-controlled humidity and temperature controls to protect the client’s extensive collection of fine wines; while guests can be more comfortable to linger in this heated space. ​The architecture of ancient French castles is suggested in the heavy, thickened, barrel-vaulted stone arches, the cross-vaulted plaster ceiling, and plaster and stone walls. ​An antique trestle table and Provencal-style rush chairs, along with a retired oak wine barrel add to the ambiance of the space. The light fixtures are inspired by medieval castles and the flooring is tumbled French limestone. ​Old wood shelves, for storing wine glasses, are built into a stone wall, and a copper-hammered bar sink and faucet is built into a thick plank of old wood. 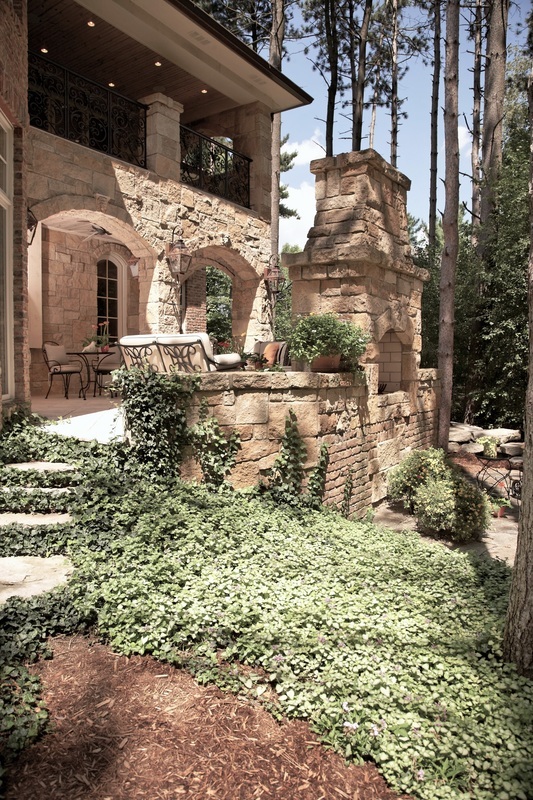 Extensive rough-cut stone is used in the architecture of this French eclectic country home and throughout the landscape design to create a charming ambiance reminiscent of French/ European villages and to create a unified plan of the home and gardens surrounding it. The design challenge was to preserve the 65-year-old towering pines on the site. This was achieved by creating stone retaining walls of rough-cut stacked ledge-stone to maintain the natural drainage of the site to protect the trees, which become a landscape feature. Guests are welcomed to the front entry door along a large free-flowing fragmented flagstone walkway that curves through the landscape. Fragmented flagstone is also used on the rear-yard multi-level terraces that create three distinct areas for conversation, dining and lounging which unify the front and rear yards. ​These terraces are designed with rough-cut ledge-stone which creates the steps from level to level. 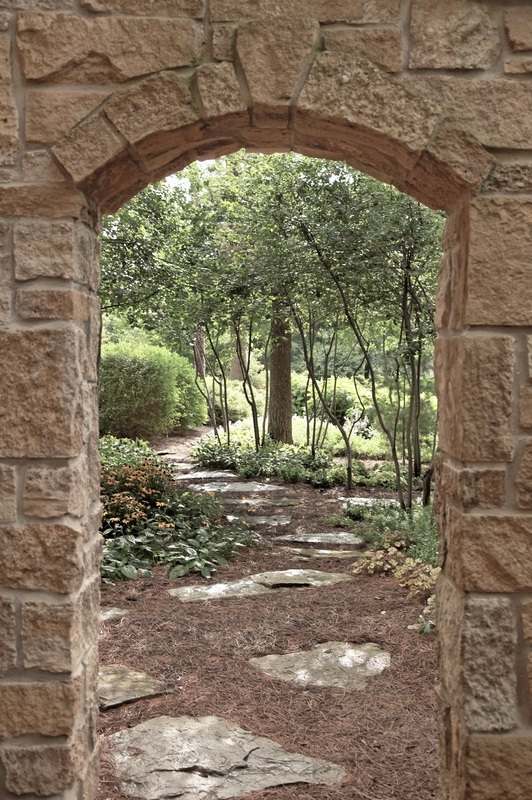 Large flat outcropping stones are used to create pathways that meander throughout the gardens, and playful architectural elements are designed throughout the landscape with stone arches to walk under and stone garden walls defining courtyards throughout. 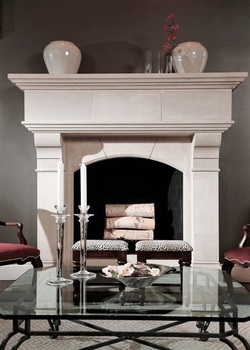 A French cut limestone masonry fireplace creates a dramatic focal point in the formal, sophisticated gathering room, which is located directly off the foyer in this French country estate home. 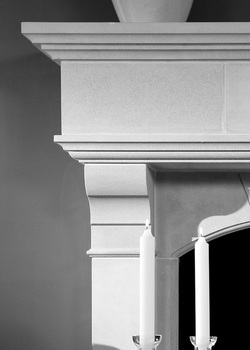 The design concept was to create a traditional fireplace design that highlights the simple natural beauty of the limestone, and while elegant and simple in design detail is dramatically scaled to emphasize and relate to the dramatic scale of the spaces that it interacts with. The limestone fireplace is viewed upon first entering the home, through the grand foyer space, and is directly on center with the front entry doors, creating an exquisite sense of symmetry and balance. ​The refined finish of the limestone is dramatically showcased against the dark charcoal grey walls of the gathering room, and is framed by the white-painted paneled millwork archway that delineates the foyer and gathering room spaces. 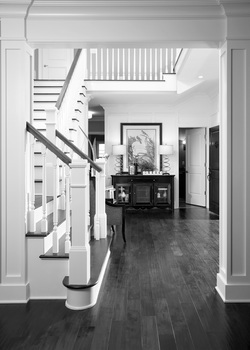 Consistent with the Shingle-style architecture of the home, exquisite, finely finished, white-painted recessed-panel millwork was installed throughout the entry foyer of this classically designed Shingle style home. Juxtaposed with the hand-scraped, dark-stained walnut floors and the coastal Cape-Cod-inspired color palette of the spaces, it inspires a look that is clean, classic, elegant and refined. ​Beautiful millwork detailing continues throughout the home with a custom-designed Shingle-style mantel and surround of the fireplace in the breakfast dining space, the beautiful millwork of the deep-coffered ceiling in the sunroom, and the custom-designed cubby lockers in the mud hall. 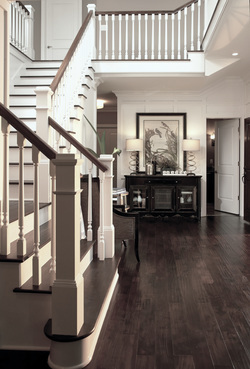 ​Beautiful crown moldings and trim work continue throughout the home. The design concept was to create a traditional fireplace design that highlights the natural beauty of the limestone, and while elegant and simple in design detail is dramatically scaled to emphasize and relate to the dramatic scale of the spaces that it interacts with. It is dramatically showcased against the dark charcoal grey walls of the gathering room, and is flanked by windows overlooking the extensive gardens and wooded areas of the rear yard. 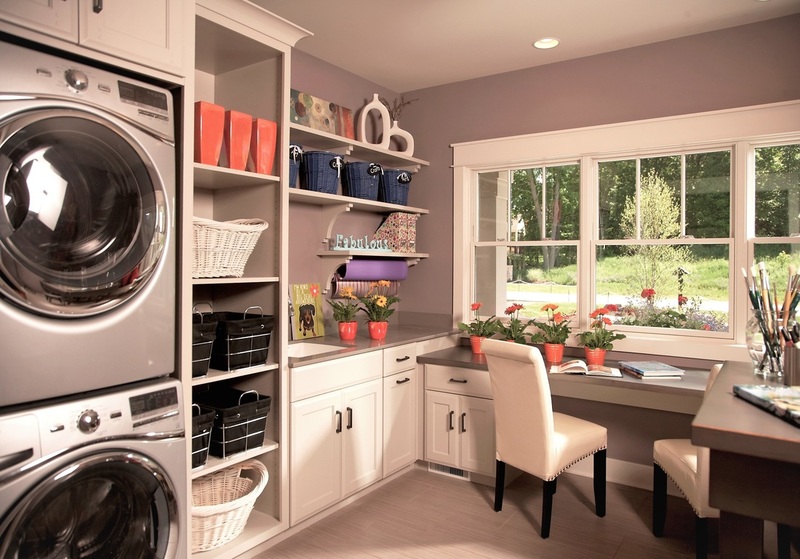 This ultimate laundry/ craft room, designed for a young active family, is consistent with the vernacular Shingle-style of the home, with edgy urban design elements, and includes a stackable front-loading washer and dryer, gift wrapping area, a craft table and a built-in desk area for paying bills, homework or other tasks. 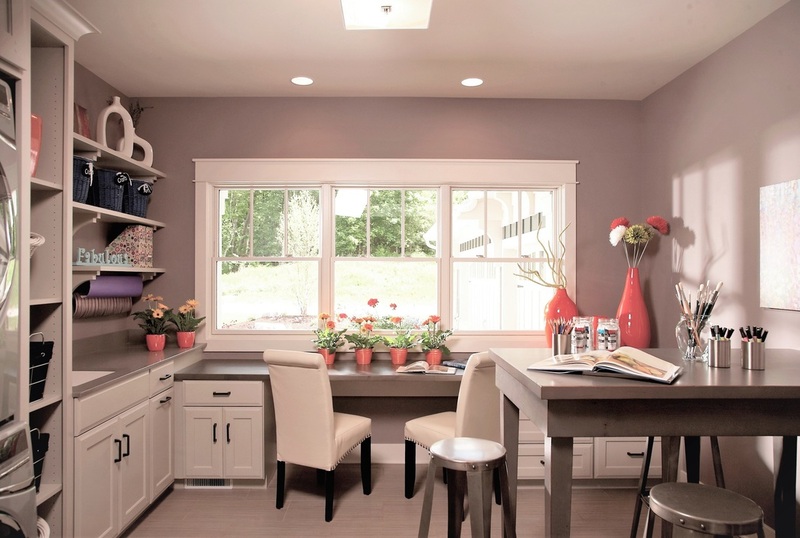 Open shelves and under-cabinets enable storage and organizing of craft baskets, laundry and supplies. Natural light floods into the space from triple-mulled double-hung windows and provides views of the front yard and monitoring of the activities at both the front and side entry areas of the home. The unique ‘barn door hardware’ sliding door system, with frosted and reeded art glass doors, lends style to the space and closes off the space from the gallery hall while allowing light to filter through. ​The doors can be partially or completely open and lay flat to conserve space both inside the room and outside the gallery hall. The clean, stylish tile floor mimics the reeded design of the art glass doors and is durable and easy to maintain. ​A color palette of soothing greys and whites, consistent throughout the home, is enlivened in this space with splashes of orange for a cheerful, uplifting feeling. This welcoming, cheerful mud hall was designed to be both consistent with the Shingle-style of the home and to be functional for a family with young children. A unique feature of this mud hall is the connection with the side-entry porch of the home, which faces into the backyard, and provides a place for adults to relax and watch the children play. 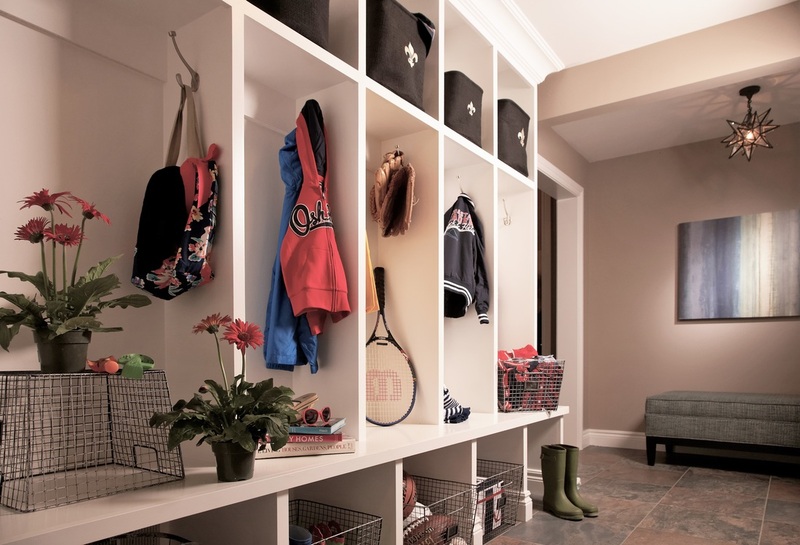 Kids can ‘come and go’ with easy access to toys, sports equipment and clothing for play in the front and backyards. 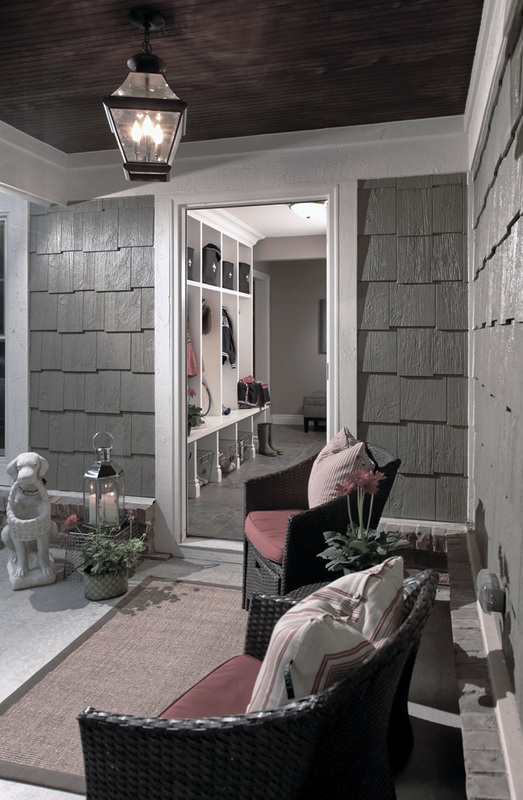 The aesthetically pleasing mud hall space is beautifully juxtaposed with the white-trimmed sage-color shake siding and stained bead-board ceiling of the side porch of this Shingle-style home. The mud hall space is anchored by the durable and beautiful slate stone floor, with white-painted custom cubby lockers consistent with the white-painted millwork throughout the home. ​These cubby lockers help organize and store children’s coats, boots, book-bags, toys, sports equipment and other necessities. Urban-inspired metal storage baskets are a fun place to store shoes and boots, while black and tan woven baskets provide storage for off-season clothing at the upper storage cubbies. 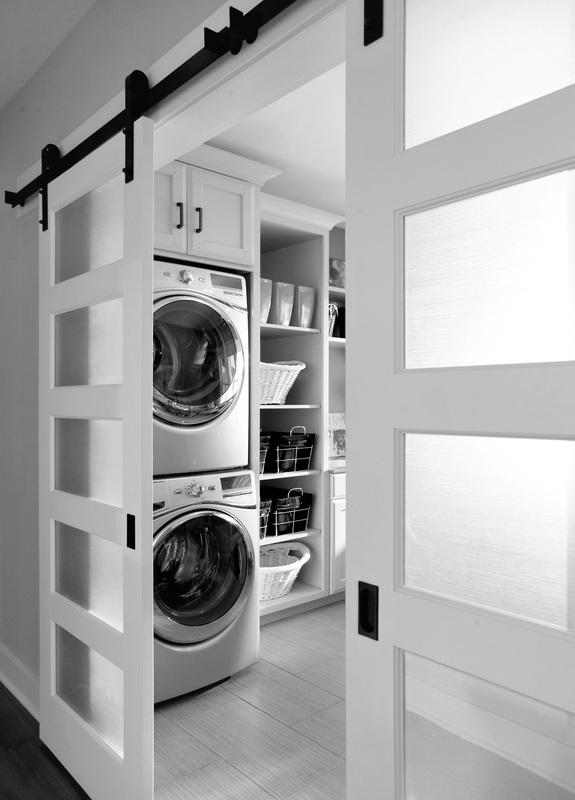 While the main laundry room is located on the second floor near the bedrooms, a second stackable washer and dryer and laundry tub in the mud hall facilitates laundry that is generated on the main level and outdoors. This space also conveniently has direct access to the garage.